Heiland can loosely be divided between Eastern and Western Heiland. The Greyward Mountains run from the south to north, dividing Heiland proper in the east from the western portion of Heiland, often called the Violet West. Eastern Heiland - Although the regions of Heiland have been divided a number of ways throughout its political and cultural history, the Eastern half of Heiland now has no official name. Both larger and much more settled than the west, Eastern Heiland is home to the majority of cities, significant families and noble houses, and cultivated land, from Somanan-populated Propolus at the southern border to the capital of Windberth in the Werdstan Mountains of the north. Notably, the remaining Aesidhe population resides in the Southern Wild. 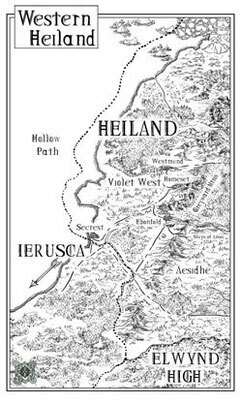 Violet West - The area of Heiland west of the Greyward Mountains has long been called the Violet West. Historically considered almost a separate nation from Heiland, the Violet West was brought under rule by Ebenhardt Idonea and administered for years thereafter by Duke Preinon Idonea. It is a center of mining, quarrying, and logging, and also provides a fair amount of fishing, as well as trade with Ierusca (called "Jerusca" here) through Secrest. The Violet West is almost entirely populated by Aeman peoples, who have in recent years actively reduced any non-Aeman residence. Windberth - The capital city of Heiland, it is built against Mount Chancer in the Werdstan Mountains in the north. 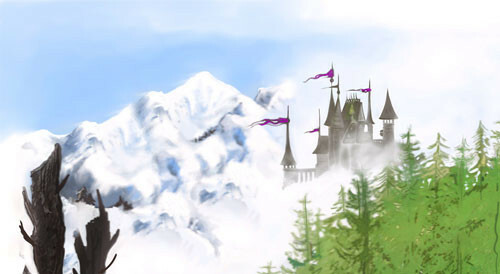 Windberth Citadel is the seat of power for the King and House of Idonea, the Sisterhood, and the Knights of Darkfire. It was built just over a decade ago. Highreach - The largest city of Heiland, it was long considered the unnoficial capital of Heiland before the construction of Windberth. The fall of Highreach is thought of as the greatest battle in Ebenhardt Idonea's War for Union, and the turning point of the war. Propolus - This city lies at the southernmost border of Heiland, near both Elwynd High and Pentaros; it has always had a significant Somanan population, was sometimes historically contested with Somana, and is still considered a haven for pirates and thieves. Palmill - An Aeman town in Heiland on the frontier of the forest inhabited by the Aesidhe. Recent events have made this village an example and rallying argument for the Knights of Darkfire. Greyward Mountains - Often called "The Greywards", these mountains stretch from southern to northern Heiland, and are technically the northernmost part of the Erentian Continental Divide. They are the larges range in Heiland, and typically also the tallest peaks. Werdstan Mountains - These mountains in northern Heiland stret eastward from the Greyward Mountain range. Windberth is built in the far east of these, against Mount Chancer, one of the largest peaks in Heiland. Steps of Amos - These foothills, like the Werdstand Mountains further north, stretches eastward from the Greyward Mountains across central much of central Heiland. The Hollow One is among them. Hollow One - A mountain at the far east of the Steps of Amos. It holds cultural significance for the Aesidhe of Heiland. King’s Road - The primary north-south road in Heiland, originally built by Somanans, which stretches from Propolus in the south to Windberth in the north. Although in disrepair through much of the Aeman dominance of Heiland, it is now being rebuilt by the Knights of Darkfire. Idonea, House of - The present ruling family of Heiland; King Ebenhardt Idonea united all of Aeman Heiland a generation before, just after the War of Scars. Sisterhood - Religious order based in Heiland; all Sisters are female, and guided by the Matriarch, currently Matron Taber. Sister-Journeywoman - Originally members of the Downcast, and precursors to the Sisterhood, these women traveled among the Aesidhe in an attempt to convert them to the Nine Temples (now non-existent), but also to exchange knowledge and help in times of illness; they were the first to accurately record the Aesidhe language; when the Sisterhood became ascendant in Heiland, they absorbed these, gave them their new name, and eventually withdrew them all from Aesidhe lands. Doctrine/Tenets - core teachings of the Sisterhood and Knights of Darkfire. The Aesidhe Tribes - The majority of Heiland was originally peopled by the Aesidhe, a dark-skinned tribal people who still remain in Heiland, but in much smaller numbers and constantly under threat by the Aeman population growth. Wenish Settlers - The first wave of settlers to Heiland were the Wenish, an early culture which migrated to Heiland before either the Angans or Aeman; Little is now known of them, but it is likely they worshipped long-forgotten gods, were matriarchal, and coexisted in relative peace with the Aesidhe population. Descendents of the Wenish people still live in Elwynd High, and a form of the Wenish language is still spoken there. Angan Raids - A seafaring culture from the Northlands or northern Numinon raided the coasts and river passages of Wenish Heiland and northern Somana for many years, occasionally settling in small numbers that were then integrated into the Wenish population. Aeman and Somanan Heiland - The most recent generations of settlers to Heiland have been Aeman and Somanan peoples. 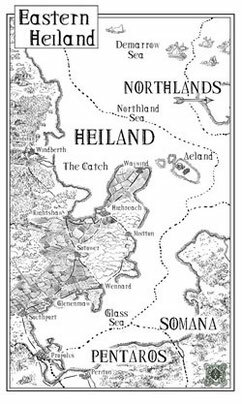 Though the Empire of Somana itself never officially claimed Heiland for itself, much of the suth and east of Heiland has, at one time or another, been predominately Somanan, from Propolus all the way to Aeland. It is the Aeman settlers from Heiland, however, who have generally held the most cultural and political significance. The Aeman were better able to incorporate the customs and mix with the earlier Wenish and Angan populations, better able to maintain good relations with the native Aesidhe, and better able to maintain political and military rule by having little desire to unite completely, and even less desire to look to an outside power such as Somana for validation. Generations of Conflict - The conflict between Aeman and Somana Heiland have been many. The Aeman, until recently, had only sporadic desire to create a single kingdom, and even Somanans' greatest efforts at dominance and unification always met with failure. Even the great road built from Propolus all the way to the Werdstan Mountains by a Somanan legion was eventually awarded with Amean resentment, resistance, and forceful dismantling of tolls by Aeman warlords and local officials. Aeman cities, particularly in the north and Violet West, have often ghettoized Somanan citizens, and Somanan cities such as Propolus, so far from Somana Imperial or Republic influence, have often fallen into political disarray, havens for thieves and pirates. New Peace - A few generations ago, with the aid of the Nine Temples, a contract made by nobles of Heiland was negotiated to allow settlement of Heiland to a specific number of Somanans by district, even to the point of legitimizing a small number of noble families. This helped define the current borders of Heiland and repel a threat of Somanan occupation, but did not truly unite Heiland into one nation. War for (Heiland) Union - It wasn't until the War of Scars that a final political unity would come to Heiland. The house of Idonea, which had gained some power and influence leading up to and during the war, claimed the throne of Heiland in the final weeks of the War of Scars. Ebenhardt Idonea, through military might and political influence, became the first King of Heiland, waging a successful War for Union with the aid of his brother, Preinon Idonea, and Matron Taber of the Sisterhood. He has ruled for fifteen years since.